In July, a group of 25 engineering students from Queen’s will take on 100 universities in the annual Formula Student competition around the home of Formula 1, Silverstone, in its latest car, QFR18. Queen’s Formula Racing (QFR) team has been competing since 2000, finishing seventh overall last year. Supported by Vickerstock – an engineering recruitment agency who have just signed a three year sponsorship deal with QFR – the team will line up on the grid against some of the top engineering talent from across the globe. QFR has an expanded team this year with a total of 43 engineering students taking part. Adam Hall, a Mechanical Engineer from Armagh, explained: “QFR came first in the acceleration event and won the prize for most efficient internal combustion engine in 2017. “After analysing the weaknesses of last year’s car the team put a greater emphasis on the vehicle’s suspension system, which has been completely redesigned as part of a third-year project. Dr Geoff Cunningham, Senior Lecturer in the School of Mechanical and Aerospace Engineering, commented: “The students are wholly responsible for the car’s design every year. As part of their degree projects, third and fourth year mechanical engineers have managed to design and build QFR18 in just nine months! Dr Cunningham added: “Formula Student adds a practical aspect to the engineering theory the students are learning on a daily basis. The car’s assembly commenced at the start of the Easter break. With only a couple of weeks left to have it finished the team will take it to Nutts Corner Circuit to test and tune the latest design before shipping it across the Irish Sea in July. This year’s team leader, Gavin White (pictured above), a final-year Mechanical Engineering student from Coleraine, said: “The sense of achievement of working on this project has been rewarding throughout, especially seeing the progress through the year on CAD (computer aided design) and now as the car is being built ‘in the flesh’. “As well as watching the project progress, being able to see each team member develop has been very satisfying. 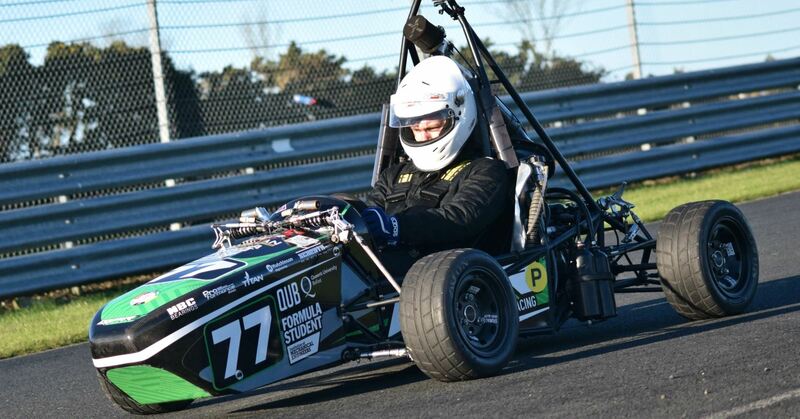 Queen’s Formula Racing will compete at Formula Student UK from 13-15 July at Silverstone Circuit, England. Follow QFR online at www.queens-racing.com and on social media to find out more about the individual team members and this year’s car.